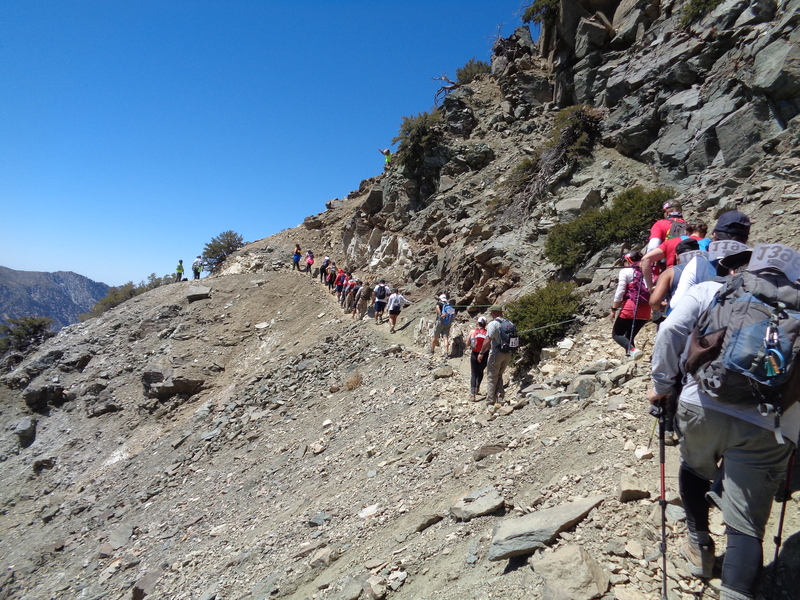 It was an incredible day on Baldy -- an enormous turn out to honor our heroes. I met other team members of the Whitney Portal Store Message Board at the staging area. I also got to hug two of my personal RMRU SAR heroes -- Dana Potts and Rob May. Due to the volume of attendees, groups were sent off about every 15 minutes. Our bibs were checked off and we received tokens at each of five "Camps" which we exchanged for swag at the finish. The positive energy on the mountain was just unbelievable. Due to being with so many wonderful people, I was completely distracted walking up the road to the Notch. At Camp 2, Tim Medvetz of the Heroes Project drove up and asked us if we wanted a ride Tim is on the left and Doug Thompson (our team captain who has given so much to so many of us) is on the right (picture by Baldy legend Shin Nimura). At Camp 3, USMC Retired SSGT Charlie Linville (first combat wounded veteran to summit Everest a year ago) kindly took a picture with me and signed my bib. Then we started up the Devil's Backbone (picture by Shin). The eroded area of the DBB (picture by Rick Graham). At Camp 4, photo with USMC CPL. Kionte Storey who summited the Vinson Massif (photo by Shin who is on the left). WPSMB summit photo. Wild man Patrick (aka Lilbitmo) is on my left (right in photo). Reflecting on the event -- lots of participants told me that I was amazing and inspirational, probably because I look old and limp I am 63 but look older due to skin damage from numerous years in young adulthood as an endurance athlete. I also have a weird hiking style due to seven spinal fusions, a badly broken/plated/screwed left ankle and a baldy broken/plated/screwed right shoulder. For the record, my "challenges" are nothing compared to those of the combat-wounded veterans we met on the mountain. I am completely in awe of their courage and persistence. I also have the highest respect for those who serve and have served our country. This was an emotionally powerful mountain party celebrating our heroes -- I'll be back next year. Thank you to our heroes, the organizers, volunteers and participants.